Nonactivated CD4+CD25+ regulatory T cells constitutively express glucocorticoid-induced TNFR family-related receptor (GITR), a TNFR family member whose engagement was presumed to abrogate regulatory T cell-mediated suppression. Using GITR−/− mice, we report that GITR engagement on CD25−, not CD25+ T cells abrogates T cell-mediated suppression. Mouse APCs constitutively express GITR ligand (GITR-L), which is down-regulated following TLR signaling in vivo. Although GITR−/−CD25− T cells were capable of mounting proliferative responses, they were incapable of proliferation in the presence of physiological numbers of CD25+ T cells. Thus, GITR-L provides an important signal for CD25− T cells, rendering them resistant to CD25+-mediated regulation at the initiation of the immune response. The down-regulation of GITR-L by inflammatory stimuli may enhance the susceptibility of effector T cells to suppressor activity during the course of an infectious insult. Naturally occurring regulatory CD4+CD25+ T cells serve a vital function as cellular attenuators of immune responses. Early studies demonstrated that the transfer of CD4+CD25− T cells to immunodeficient hosts led to the induction of a spectrum of autoimmune diseases, which could be prevented by cotransferring CD4+CD25+ T cells (1). These and other studies led to the proposal that CD4+CD25+ regulatory T cells actively promote tolerance by inhibiting CD25− T cell responses to self Ags. Subsequent studies have implicated CD4+CD25+ regulatory T cells in the suppression of responses to viral, bacterial, and protozoal infections (2, 3, 4, 5, 6, 7). Together these studies provided evidence that removal of CD25+ cells enhances the immune response. Thus, while the dramatic differences in disease outcome that result from the presence or absence of CD4+CD25+ T cells clearly highlight their importance, a fundamental understanding of the mechanisms controlling their function remains to be delineated. Glucocorticoid-induced TNFR family-related receptor (GITR),3 a member of the TNFR superfamily, is constitutively present on nonactivated T cells (8, 9, 10), and is particularly abundant on CD4+CD25+ T cells (9, 10). The high-level, basal expression by CD4+CD25+ regulatory T cells suggested an important role for GITR on this subset. This possibility was further supported by functional studies in which the addition of agonistic anti-GITR Abs to cocultures of suppressor and responder T cells led to a reversal of suppressive activity (9, 10). Although it has been proposed that GITR is a more faithful marker of regulatory T cells (11), GITR expression does not exclusively distinguish this subset, as up-regulation of GITR also occurs following activation of CD25− T cells (9, 10). The lack of suitable reagents has precluded a detailed functional analysis of GITR/GITR ligand (GITR-L) interactions under more physiological conditions, although several groups have recently reported the cloning of the murine GITR ligand (12, 13, 14). In this study, we have identified the mouse ortholog of GITR-L and generated an antagonistic Ab against it. Using this reagent, the tissue distribution and regulation of GITR-L were examined. In addition, the ability of GITR/GITR-L interactions to regulate T cell suppression was investigated using GITR−/− mice. As both CD25− and CD25+ T cells express GITR, albeit to varying degrees, the previous studies demonstrating an inhibition of suppressor function upon treatment of cocultures with an agonistic anti-GITR Ab yielded equivocal results regarding the cellular target of GITR engagement. In this study, using combinations of CD4+CD25+ and CD4+CD25− T cells from wild-type and GITR−/− mice in coculture experiments, we find that ligation of GITR on the CD25− responder T cells, not the CD25+ suppressor T cells, was required to abrogate suppression. In the absence of CD4+CD25+ T cells, GITR−/− T cells mounted proliferative responses similar to those of wild-type animals, although they were totally suppressed in the presence of physiological numbers of CD25+ T cells. Our results suggest that GITR/GITR-L engagement provides a previously undefined signal that renders effector T cells resistant to the inhibitory effects of CD4+CD25+ T cells. Thus, the down-regulation of GITR-L expression subsequent to secondary inflammatory signals may facilitate CD25-mediated suppression and prevent the deleterious consequences of an exuberant effector cell response. All Abs used for flow cytometry or functional studies were from BD Pharmingen (San Diego, CA), except Tri-color-labeled anti-CD4 (clone CT-CD4) and anti-B220 (clone RA3-6B2), which were purchased from Caltag Laboratories (Burlingame, CA). Purified F(ab′)2 of goat anti-IgM μ-chain was purchased from Jackson ImmunoResearch Laboratories (West Grove, PA). Anti-IL-2 (clone S4B6) was used as ascites fluid. Human rIL-2 was obtained from the National Cancer Institute (Frederick, MD). IL-4, IFN-γ, IL-12, and T cell enrichment columns were purchased from R&D Systems (Minneapolis, MN). Poly(I:C) and LPS were purchased from Sigma-Aldrich (St. Louis, MO). CpGs were purchased from InvivoGen (San Diego, CA). Anti-GITR-L (clone 5F1) and anti-GITR (clone DTA-1) were produced in house. Anti-B220, anti-CD11c, anti-CD11b, anti-CD8, anti-CD4, and anti-PE magnetic beads were purchased from Miltenyi Biotec (Auburn, CA). Tosyl-activated Dynabeads (Dynal Biotech, Lake Success, NY) were covalently coupled to the anti-CD3 (2C11), as previously described (15). Coated beads were stored at 4°C and used within 10 days of preparation. BALB/c and C57BL/6 mice (6- to 8-wk-old females) were purchased from the National Cancer Institute (Frederick, MD) animal facility. CD28−/− mice were provided by A. Singer (National Institutes of Health/National Cancer Institute). GITR+/− embryos (Sv129 × B6) were provided by C. Ricarrdi (Perugia University Medical School, Perugia, Italy) (16). The rederived GITR+/− mice were backcrossed once with C57BL/6 mice, and the resulting progeny were screened for the mutant allele by PCR. The identified GITR+/− progeny were then intercrossed to generate GITR−/− mice. All mice were bred and housed at National Institutes of Health/National Institute of Allergy and Infectious Diseases facilities under specific pathogen-free conditions. The amino acid sequence for human GITR-L (GenBank accession number NM_005092) was used to search the Celera database for the murine GITR-L (mGITR-L). Genomic sequence ga_x5j8b7w7wj5_041.cm_aa_2 contained three high scoring pair regions. Based on the assumption that these regions correspond to exons for mouse GITR-L, primers were designed for PCR amplification. The forward primer (5′-ATGGAGGAAATGCCTTTGAGAG-3′) and reverse primer (5′-GAATGGTAGATCAGGCATTAAGATG-3′) amplified a cDNA clone from a mouse thymus library. The resulting fragment was subcloned, and the DNA sequence was determined. A subsequent full-length clone was amplified by PCR from the previous construct using 5′-TTTAAAGTCGACCCACCATGGAGGAAATGCCTTTGAGAG-3′ (forward) and 5′-TTTAAAGAATTCTCATTAAGAGATGAATGGTAGATCAGGCAT-3′ (reverse) primers. The resulting PCR fragment was subcloned into the GFP-RV retroviral vector (17), and sequence determination of the final cDNA clone was performed. This vector was then transfected into the Phoenix cell line. Supernatants from the transfected Phoenix cells were used to transduce the YB2/0 cell line. GFP-expressing YB2/0 cells were then FACS sorted and maintained in culture. The predicted mGITR-L amino acid sequence is identical with that of another group (14), except for the substitution of an alanine for a valine at amino acid position 48 in their sequence. Lewis rats were immunized once s.c. with 100 × 106 YB2/0-GITR-L cells in CFA. Two weeks later, these rats were immunized s.c. with 100 × 106 YB2/0-GITR-L cells in IFA. Two weeks later, rats were boosted with 50 × 106 YB2/0-GITR-L cells in PBS. Four days later, the spleen was harvested and cell fusion was performed, as previously described (18). The supernatants from the resulting hybridomas were screened by flow cytometry using Phoenix-GITR-L and Phoenix cells. Abs were purified from cell culture supernatants using protein G-loaded columns, and eluted Abs were dialyzed in PBS. All T cell subsets were purified from peripheral lymph nodes (LNs) of mice. Briefly, LN cells were stained with anti-CD25 PE and subsequently labeled with anti-PE magnetic microbeads and purified on an autoMACS (Miltenyi Biotec), according to the manufacturer’s protocol. Purity of the CD25+ cells was typically between 97 and 99%. Cells remaining in the negative fraction were subsequently labeled with either anti-CD4 or anti-CD8 microbeads and purified using the positive selection procedure on the autoMACS. Purity was routinely 90–95%. T cell-depleted splenocytes were prepared by depleting Thy-1.2+ cells using the autoMACS. B220+ cells were purified from splenocytes in a similar fashion using anti-B220 microbeads (Miltenyi Biotec), with purity routinely greater than 90%. Peritoneal cells were prepared by flushing the peritoneal cells with 10 ml of cold HBSS. For splenic dendritic cells (DCs), splenocytes were prepared in a manner similar to that described (19). Splenic DCs were then purified from the suspensions using anti-CD11c microbeads (Miltenyi Biotec). The resulting DC suspensions were routinely 85–90% pure. Rat CD4+CD25− cells were generated by depleting rat splenocytes of CD25+ cells using PE anti-rat CD25 (OX-39) Abs, followed by treatment with anti-PE microbeads. After depletion, CD4+ cells were then selected from the depleted fraction using anti-rat CD4 microbeads. Suppression assays were performed, as described (20). Briefly, (5 × 104) cells were cocultured in FBS-supplemented RPMI 1640 with irradiated (3000 R) T cell-depleted splenocytes (5 × 104) in the presence of 0.5 μg/ml anti-CD3 mAb (2C11) in 96-well flat-bottom plates. To some cultures, Abs specific for GITR or a rat Ig isotype were added at a final concentration of 2 μg/ml. Titrated numbers of CD4+CD25+ T cells were added at final suppressor to responder ratios of 0:1, 1:2, 1:4, or 1:8. Cultures were pulsed with 1 μCi of [3H]thymidine for the final 5–8 h of a 72-h culture and were performed in triplicate, unless otherwise indicated. Cocultures of rat and mouse T cell subsets were set up in a similar manner, except irradiated (3000 R) CD4-depleted rat splenocytes were used as APCs, and rat and mouse T cells were stimulated using a mixture of anti-rat CD3 and anti-mouse CD3 mAbs (0.25 μg/ml of each). To assess the blockade of the GITR costimulation by anti-GITR-L mAb, HT-2 T cells (GITR+/TCR+, 4 × 104/well) were cultured in the presence of irradiated (10,000 R) GITR-L-expressing YB2/0 (104/well) cells and anti-CD3 mAb-coated beads. Increasing concentrations of anti-GITR-L mAb (5F1) or isotype (rat IgG2a) mAb control were added at the initiation of the culture period. Proliferation was measured by [3H]thymidine incorporation for the last 5 h of a 44-h culture period. CD25+-depleted LN cells were prepared on the autoMACS, as described above. Cells were labeled with CFSE at a concentration of 2 μM for 8 min in a 37°C water bath. Cells were then washed in complete RPMI 1640. Cells (5 × 104/well) were then cultured in 96-well plates in the presence or absence of human rIL-2 (50 U/ml). Duplicate wells were either pulsed with 1 μCi of [3H]thymidine for the final 5–8 h of a 72-h culture or used for analysis of CFSE dilution. To further elucidate the role of the GITR/GITR-L interaction in regulatory T cell function, the murine GITR-L was identified by searching the Celera mouse genome database for sequences homologous to the human GITR-L. Primers were designed based on the putative mouse sequence, and cDNA clones were isolated. To demonstrate that the isolated cDNA was a functional ligand for mGITR, the putative mGITR-L cDNA was expressed in the rat cell line, YB2/0. These cells were then assessed for their ability to reverse suppression mediated by variable numbers of cocultured CD4+CD25+ T cells. The presence of GITR-L-expressing YB2/0 cells completely inhibited the suppression of CD4+CD25− responders, in a manner similar to that observed upon GITR engagement with anti-GITR Ab (Fig. 1⇓A). 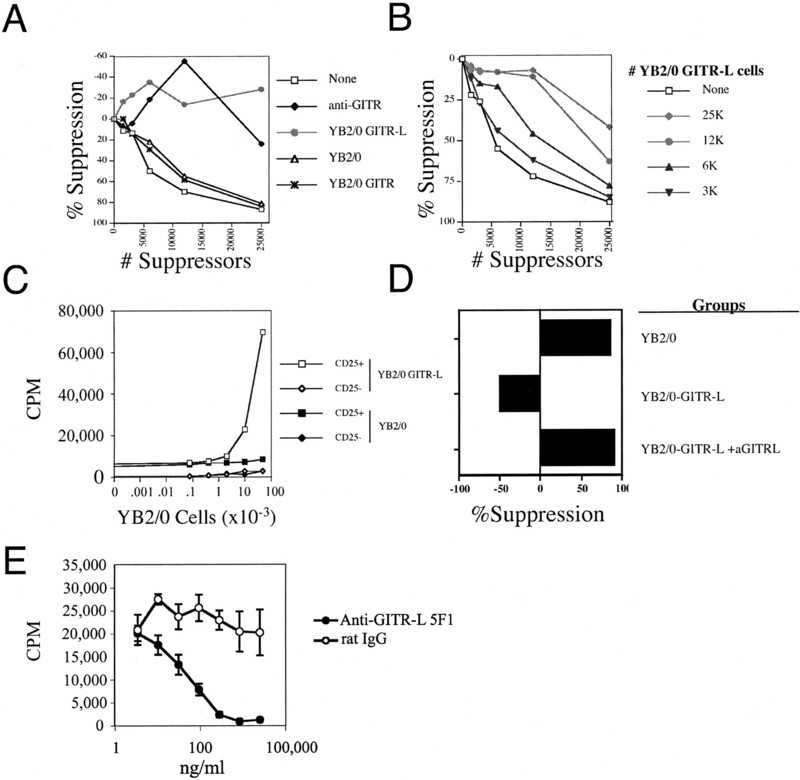 YB2/0 cells transduced with a control retrovirus or one conferring GITR expression did not reverse suppression (Fig. 1⇓A). Furthermore, the addition of variable numbers of YB2/0 cells transfected with GITR-L led to a dose-dependent inhibition of suppression (Fig. 1⇓B). Previous studies demonstrated that GITR engagement with anti-GITR Abs promoted TCR-independent proliferation of CD4+CD25+ T cells in the presence of IL-2 (10). Similarly, the presence of YB2/0 cells expressing GITR-L enabled the proliferation of CD25+, but not CD25− T cells in the presence of IL-2 (Fig. 1⇓C). The YB2/0 cells expressing GITR-L were further used as an immunogen to generate mAbs (detailed in Materials and Methods). Supernatant from clone 5F1 was able to inhibit the reversal of suppression caused by GITR-L-expressing YB2/0 cells, further confirming its specificity (Fig. 1⇓D). YB2/0-GITR-L cells were also able to deliver a costimulatory signal for augmention of the proliferation of the HT-2 cell line to anti-CD3-coated beads in the absence of APC (Fig. 1⇓E). The addition of anti-GITR-L mAb led to a dose-dependent decrease in T cell proliferation (Fig. 1⇓E), indicating that the anti-GITR-L Ab was specifically blocking the GITR/GITR-L interaction. Cells expressing GITR-L prevent CD25+-mediated suppression. A, CD4+CD25− T cells (5 × 104) and irradiated (8000 R) YB2/0-GITR-L, YB2/0-GITR, or YB2/0 cells (5 × 104) were cultured with varying numbers of freshly isolated CD4+CD25+ regulatory T cells in the presence of irradiated (3000 R) T cell-depleted splenocytes (5 × 104) and soluble anti-CD3 Ab (0.5 μg/ml). For comparison, cocultures of CD4+CD25− and CD4+CD25+ T cells treated with (♦) or without (□) the anti-GITR Ab were also performed. 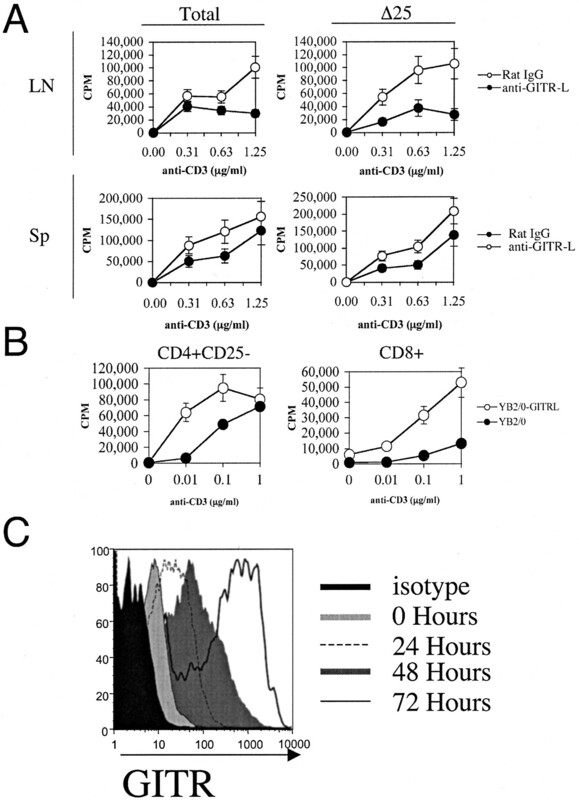 B, Cocultures of CD4+CD25− and CD4+CD25+ T cells (5 × 104) with irradiated (8000 R) YB2/0-GITR-L cells in the presence of irradiated (3000 R) T cell-depleted splenocytes (5 × 104) and soluble anti-CD3 Ab (0.5 μg/ml). C, CD4+CD25+ (5 × 104, squares) or CD4+CD25− T cells (5 × 104, diamonds) were cultured with irradiated YB2/0-GITR-L cells (open symbols) or YB2/0 cells (filled symbols) in the presence of exogenous IL-2 (100 U/ml), and [3H]thymidine incorporation was measured after 72 h. D, Culture medium or supernatant from cultures of anti-GITR-L-producing hybridomas was added to cocultures of CD4+CD25+ (2.5 × 104) T cells, CD4+CD25− T cells (5 × 104), irradiated T-depleted splenocytes (3000 R) (5 × 104), and irradiated (8000 R) YB2/0 or YB2/0-GITR-L (5 × 104) cells. The percentage of suppression was calculated based on the proliferation of CD4+CD25− T cells cultured without CD4+CD25+ T cells (0%). E, HT-2 T cells (GITR+/TCR+, 4 × 104 cells/well) were cultured in the presence of irradiated GITR-L-expressing YB2/0 (104 cells/well) cells and anti-CD3 mAb-coated beads. To assess the effect of GITR/GITR-L blockade on HT-2 proliferation, increasing concentrations of anti-GITR-L mAb (5F1) or isotype (rat IgG2a) mAb control were added at initiation of the culture period. Proliferation was measured by [3H]thymidine incorporation for the last 5 h of a 44-h culture period. The anti-GITR-L Ab was used to examine the expression of GITR-L in mouse tissues by flow cytometry. Freshly isolated CD11c+ splenic DC subsets constitutively expressed low levels of GITR-L (Fig. 2⇓A). Surface expression of GITR-L was noticeably higher among splenic CD11clowB220+ plasmacytoid DCs (21) (Fig. 2⇓B). 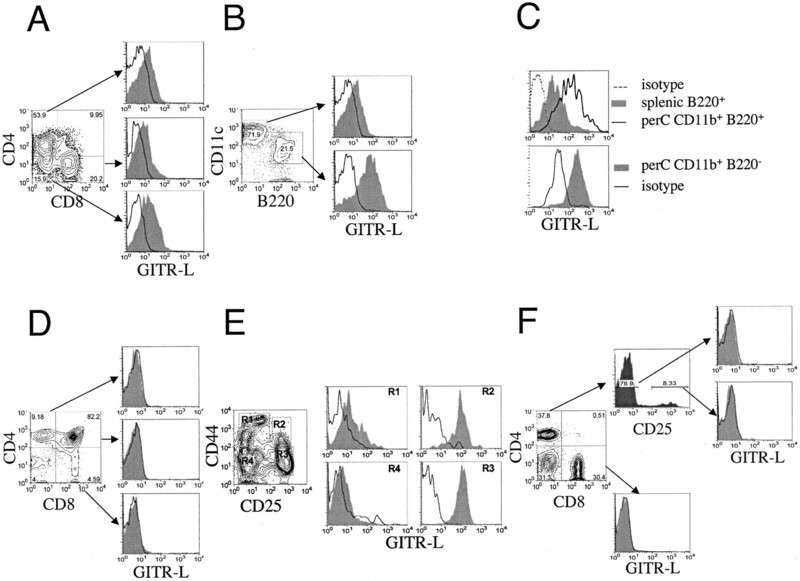 Freshly isolated B220+ splenic B cells constitutively expressed GITR-L, as did peritoneal B-1 B cells (CD11b+B220+ peritoneal cells), although at higher levels (Fig. 2⇓C, top). Resting peritoneal macrophages were also found to express this ligand (Fig. 2⇓C, bottom). Thymocyte subsets undergoing selection did not express measurable amounts of GITR-L (Fig. 2⇓D). Expression of GITR-L was examined on CD4−CD8− (double-negative (DN)) thymic precursors, which can be further subdivided based on expression of CD44 and CD25 (22). DN CD44+CD25+ and DN CD44−CD25+ thymic precursors expressed high levels of GITR-L (Fig. 2⇓E). However, GITR-L was undetectable on unstimulated LN T cells (Fig. 2⇓F). Distribution of GITR-L-expressing cells in lymphoid tissues. A, Flow cytometric analysis of staining with anti-GITR-L (filled) or isotype Ab (open) of CD11c+ cells enriched from the spleen of BALB/c mice with magnetic beads. Histograms are gated on the indicated subsets of CD4+, CD8+, and CD4−CD8− cells. B, Staining with anti-GITR-L mAb (filled) or an isotype control (open) was done on the indicated subsets of freshly isolated CD11c+ splenic DCs from BALB/c mice. C, Staining for expression of GITR-L by B220+ cells among total splenocytes (filled), CD11b+B220+-gated peritoneal cells (bold line), or staining with an isotype control (broken line). D, Thymocytes were stained for expression of CD4, CD8, and either GITR-L (filled) or an isotype control (open). E, Staining of GITR-L expression (filled) or an isotype (open) by gated CD4−CD8− thymocyte subsets defined by expression of CD44 and CD25. F, Expression of GITR-L (filled) or isotype staining (open) by CD4- or CD8-gated LN cells. Results above are representative of five independent experiments. The effects of B cell activation on GITR-L expression were examined following treatment with TLR ligands, or anti-CD40 and IL-4, or anti-IgM. Stimulation of either splenic or peritoneal B cells resulted in a rapid, but transient up-regulation of GITR-L, which was apparent after 4 h with most of the treatments (Fig. 3⇓A). Following 48–60 h of stimulation, expression declined to below prestimulation levels, where it stabilized. An exception was poly(I:C)-treated B-1 B cells from the peritoneal cavity, which did not display this down-regulation during the time points examined. As expected, levels of CD86 increased over the course of the experiment in all groups, indicating that the observed down-regulation of GITR-L was not secondary to cell death (data not shown). The reduction of GITR-L expressed by B cells after treatment with anti-CD40 and IL-4 suggested that expression could be modulated following the provision of T cell help. We assessed GITR-L expression by B cells among total splenocytes after culture with anti-CD3 Ab. Under these culture conditions, expression of GITR-L on B220+ splenocytes was also down-regulated after 48 h (Fig. 3⇓B). Thus, Th cell activity also led to a reduction in the expression of GITR-L by splenic B cells. APCs down-regulate GITR-L following stimulation. A, Expression of GITR-L by purified splenic B220+ B cells or total peritoneal cells (gated on B220+CD11b+-expressing cells) at different time points following treatment with poly(I:C) (10 μg/ml), LPS (0.5 μg/ml), CpGs (oligonucleotide 1826, 1 μM), anti-CD40, and IL-4 (10 μg/ml and 20 ng/ml, respectively) and a F(ab′)2 of goat anti-IgM μ-chain (1 μg/ml). The open histograms depict GITR-L expression by the same cells incubated in medium alone. B, Expression of GITR-L by B220+ B cells present among total splenocytes treated with anti-CD3 mAb (0.5 μg/ml) after a 48-h culture period. C, Expression of GITR-L (top histograms) and CD86 (bottom histograms) by purified CD11c+ DCs treated with (filled) or without (bold line) LPS (0.5 μg/ml) at the indicated time points after treatment. D, Expression of GITR-L by total splenocytes gated on CD4+- or CD8+-expressing cells after a 48-h culture period in the presence of soluble anti-CD3 mAb (0.5 μg/ml). All experiments were conducted with tissues isolated from BALB/c mice and are representative of two to four independent experiments. Splenic CD11c+ DCs were enriched with magnetic beads and examined for expression of GITR-L after 12 and 36 h of culture in the presence of LPS. Untreated and LPS-treated DCs expressed GITR-L during the initial 12 h, with modest up-regulation induced by LPS. However, by 36 h, expression of GITR-L was undetectable on both treatment groups (Fig. 3⇑C), while CD86 expression was up-regulated, as expected (23). This reduction in GITR-L expression by splenic DCs cultured in medium alone suggests the spontaneous DC maturation that occurs during in vitro culture (24) is sufficient to down-regulate expression of GITR-L. For this reason, only results following LPS stimulation are shown, although DCs were subjected to the same treatments shown for B cells. Similar to the results of another published report (13), we found that bone marrow-derived DCs express GITR-L constitutively, which was only marginally reduced after treatment with various TLR ligands (data not shown). Both CD4 and CD8 T cells expressed measurable levels of GITR-L after a 48-h culture of splenocytes in the presence of soluble anti-CD3 Ab (Fig. 3⇑D). Because GITR-L was constitutively expressed by APCs and because GITR/GITR-L interactions were proposed to abrogate the suppressive functions of CD4+CD25+ T cells, we tested the ability of the anti-GITR-L to enhance suppression mediated by the endogenous population of CD4+CD25+ T cells resident in secondary lymphoid organs. A comparison was made of the proliferative responses of total or CD25+-depleted LN and splenocytes cultured in the presence or absence of the anti-GITR-L Ab. The addition of anti-GITR-L Ab reduced the proliferative response of total LN cells (Fig. 4⇓A, top left) and, to a lesser degree, total splenocytes (Fig. 4⇓A, bottom left). However, the inhibitory effect was also apparent in CD25+-depleted cultures (Fig. 4⇓A, LN, top right; spleen, bottom right), raising the possibility that GITR/GITR-L interactions provide costimulatory signals for CD25− T cells. Blocking GITR/GITR-L interactions inhibits lymphocyte proliferation. A, Proliferation of either total or CD25-depleted (Δ25) LN (1 × 105) and splenocytes (0.5 × 105) after 72-h culture with different concentrations of soluble anti-CD3 (x-axis). Cells were incubated either in the presence of purified anti-GITR-L mAb (10 μg/ml) (•) or a rat IgG2a isotype control (10 μg/ml) (○). Results are representative of three independent experiments. B, Proliferation of CD4+CD25− and CD8+ T cells in the presence of 5 × 104 irradiated (8000 R) YB2/0-GITR-L or control YB2/0 cells and irradiated (3000 R) T-depleted APCs (5 × 104). Cultures were activated with different concentrations of soluble anti-CD3 mAb, and proliferation was measured after 72 h of culture. Bars indicate the SD values. 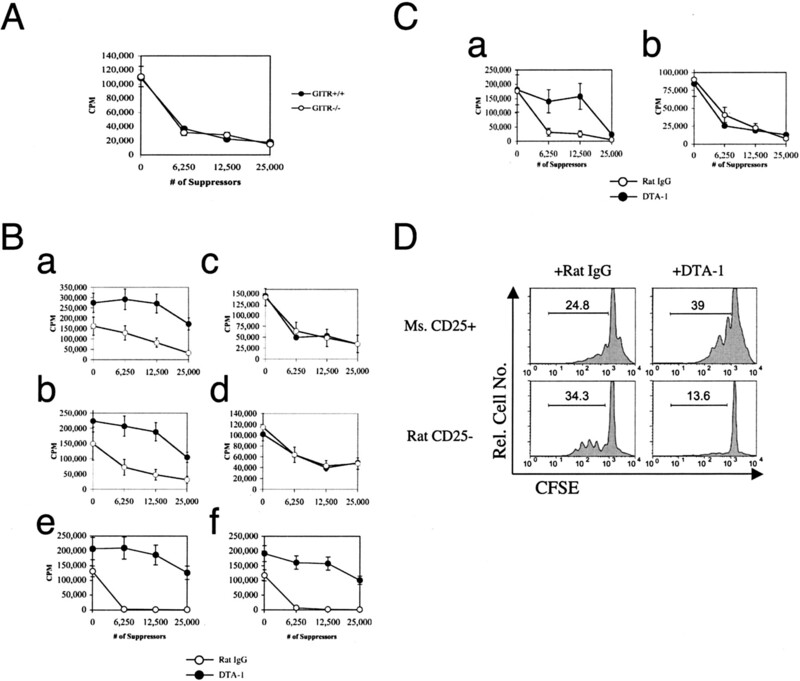 C, Expression of GITR by purified CD4+CD25− T cells at different time points following activation with soluble anti-CD3 (0.5 μg/ml) in the presence of irradiated (3000 R) T-depleted splenocytes. Results are representative of at least two independent experiments. To directly test this possibility, the proliferative responses of purified CD4+CD25− and CD8+ T cells were examined with splenic APCs and YB2/0 cells either expressing GITR-L or not. The proliferation of both CD4+CD25− and CD8+ T cells was substantially enhanced in the presence of YB2/0-GITR-L cells, which was particularly evident at low concentrations of anti-CD3 (Fig. 4⇑B). It was somewhat surprising that the anti-GITR mediated its effects by acting on CD4+CD25− T cells, as resting T cells express only low levels of GITR. However, the expression of GITR is rapidly up-regulated following T cell activation, reaching maximal levels between 48 and 72 h (Fig. 4⇑C). These results support the possibility that GITR/GITR-L interactions can influence CD25− T cell activation independently of regulatory CD4+CD25+ T cells. To shed additional light on the role of GITR/GITR-L interactions in regulatory T cell function, we examined the development and function of regulatory T cells in GITR-deficient mice. No differences in the thymic CD4/CD8 expression profile were noted. Furthermore, the frequency of CD25+-expressing CD4+ SP thymocytes was similar in GITR+/+ and GITR−/− animals, while the absence of CD28 led to a sizable decrease in this population (Fig. 5⇓A). However, the frequency of CD4+CD25+ T cells in peripheral LNs and spleen was modestly (∼33%) reduced in GITR−/− animals, although to a lesser degree than that seen in CD28−/− mice (Fig. 5⇓A). Heterozygous GITR+/− animals, which exhibit reduced expression of GITR (Fig. 5⇓B), also demonstrated a reduction in the frequency of CD4+CD25+ T cells. Differences between GITR−/− and GITR+/+ animals in the frequency of CD4+ cells expressing CD25 were statistically significant in the LNs and spleen (Fig. 5⇓B). These data raise the possibility that GITR may have overlapping functions with CD28 (25) in regulating the size of the peripheral CD4+CD25+ T cell pool; however, unlike CD28, GITR appears to be dispensable for CD25+ T cell development. CD4+CD25+ T cells are reduced in frequency in GITR−/− mice. A, Flow cytometric analysis of the CD4/CD8 staining profile of thymus, LNs, and spleen of CD28−/− mice or GITR−/− mice and littermates of the indicated genotypes. Right histograms, Depict expression of CD25 gated on CD4-expressing cells. Numbers in quadrants reflect the respective frequencies of cells present. Only live cells are shown based on forward and side light scatter values. B, Comparison of the frequency of CD25-expressing CD4 cells found in the thymus (Thy), LN, and spleen of GITR−/− and GITR+/+ mice. Results show the average frequencies calculated from flow cytometric analysis of two independent experiments with a total of five mice in each group (∗, p < 0.05). Bars indicate the SD values. C, GITR+/− mice exhibit GITR haploinsufficiency. GITR expression was examined on CD4+CD25+ LN T cells. Results are representative of two independent experiments. Previous studies suggested that ligation of GITR on CD4+CD25+ T cells inhibited their suppressive capabilities (9, 10). However, because activated T cells also express GITR, we sought to determine the relevant cellular target(s) of GITR engagement resulting in the abrogation of suppression. We initially compared the relative abilities of CD4+CD25+ T cells from GITR+/+ and GITR−/− mice to suppress proliferation of GITR+/+ CD4+CD25− T cells. We found that CD4+CD25+ T cells from both types of mice possessed comparable suppressive activity (Fig. 6⇓A). Proliferation was measured either in the presence or absence of anti-GITR mAb (DTA-1) in cocultures using combinations of CD4+CD25+ and CD4+CD25− T cells from GITR+/+ and GITR−/− mice. As previously reported, when both the CD25+ and CD25− T cells expressed GITR, the addition of anti-GITR mAb to cocultures resulted in an increase in the proliferative response compared with cocultures receiving isotype Ab (Fig. 6⇓Ba) (9). When CD25−, but not CD25+, T cells expressed GITR in cocultures, the addition of the anti-GITR Ab led to an enhancement in T cell proliferation similar to that seen when CD4+CD25+ T cells expressed GITR (Fig. 6⇓Bb). However, in cocultures of CD4+CD25−GITR−/− and CD4+CD25+GITR+/+ T cells, addition of the anti-GITR Ab had no effect on proliferation (Fig. 6⇓Bc). As expected, the addition of anti-GITR to cocultures of CD4+CD25−GITR−/− and CD4+CD25+GITR−/− T cells also had no effect on T cell proliferation (Fig. 6⇓Bd). Results similar to those described above were obtained with a polyclonal anti-mGITR Ab preparation obtained commercially (data not shown). In addition, we compared the abilities of preactivated CD4+CD25+ T cells from GITR+/+ (Fig. 6⇓Be) and GITR−/− (Fig. 6⇓Bf) mice to suppress wild-type CD4+CD25− T cells. Preactivated regulatory T cells from both types of mice exerted comparably potent suppressive activity, which could be reversed by the addition of anti-GITR Ab (DTA-1) irrespective of GITR expression by the CD4+CD25+ regulatory T cell subset. GITR expression by CD25− T cells is required to reverse suppression. A, Comparison of the ability of GITR−/− and GITR+/+ CD4+CD25+ T cells to suppress CD4+CD25− T cell responses. 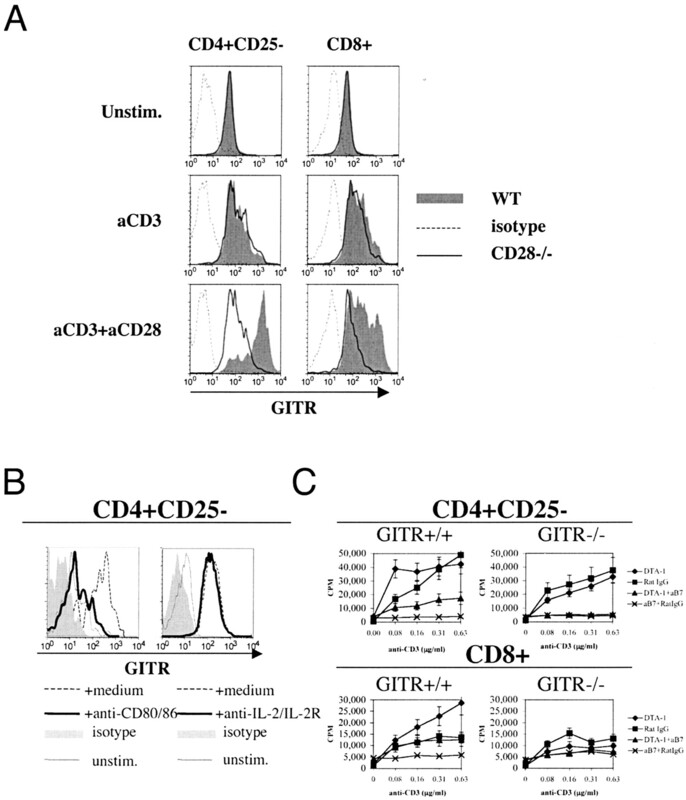 Proliferation of cocultures of CD4+CD25− T cells (5 × 104), variable numbers of CD4+CD25+ T cells (x-axis) from either GITR−/− (○) or GITR+/+ (•), and irradiated APCs from wild-type mice (5 × 104) were activated with soluble anti-CD3 (0.5 μg/ml). B, Experiments were set up, as shown in A, with the addition of 2 μg/ml of either anti-GITR (filled) or an isotype control (open) to various mixtures of GITR−/− or GITR+/+ T cell subsets. Ba, CD4+CD25−: GITR+/+, CD4+CD25+: GITR+/+; Bb, CD4+CD25−: GITR+/+, CD4+CD25+: GITR−/−; Bc, CD4+CD25−: GITR−/−, CD4+CD25+: GITR+/+; Bd, CD4+CD25−: GITR−/−, CD4+CD25+: GITR−/−. Be and Bf, Variable numbers of CD4+CD25+ T cells preactivated for 3 days with anti-CD3 and IL-2 from GITR+/+ (Be) or GITR−/− (Bf) mice were cocultured, as in A, with freshly isolated wild-type CD4+CD25− T cells in the presence of DTA-1 (•, 2 μg/ml) or an isotype control Ab (○, 2 μg/ml). C, Cocultures were set up, as in A, with variable numbers of mouse CD4+CD25+ T cells (x-axis) and either mouse CD4+CD25− T cells (Ca) or rat CD4+CD25− T cells (Cb) in the presence of irradiated (3000 R) rat APCs. Cultures were stimulated with a mixture of Abs against rat and mouse CD3 (0.25 μg/ml of each), and were treated with 2 μg/ml of either an isotype control (open) or anti-GITR (DTA-1, filled) Ab. 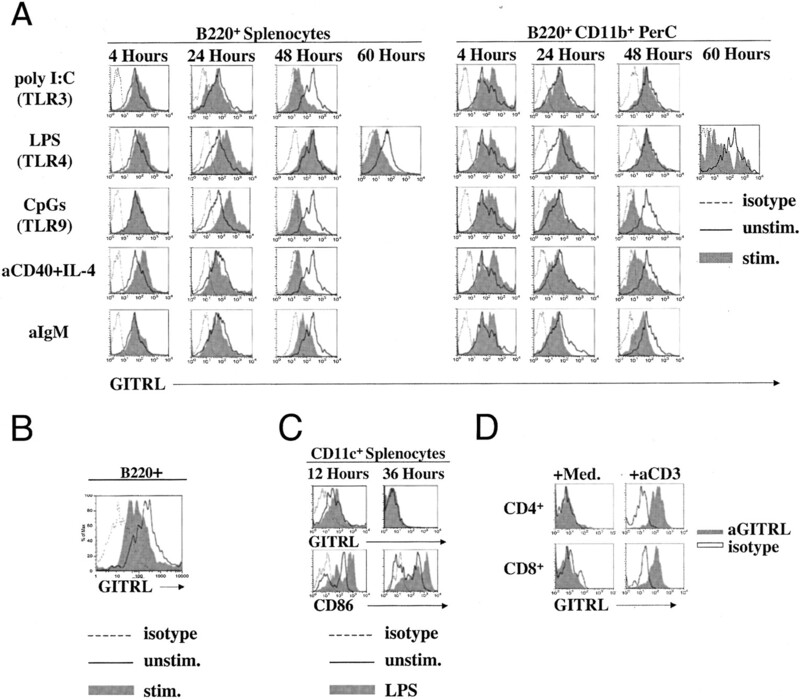 D, CFSE dilution of mouse CD4+CD25+ T cells (top row) and rat CD4+CD25− T cells (bottom row) cocultured at a 1:8 suppressor to responder ratio with isotype control (left panels) or anti-GITR Ab (DTA-1; right panels). Mouse and rat T cell subsets were distinguished in cocultures by staining with species-specific anti-CD4 Abs. Results are representative of two to four independent experiments. Bars indicate the SD values calculated from triplicate cultures, although at some points the error bars are covered by the symbols. Strong evidence in support of the hypothesis that the abrogation of suppression was a consequence of ligation of GITR expressed by CD4+CD25+ T cells was presented in a previous study, which used combinations of rat responders and mouse CD4+CD25+ regulatory T cells (9). The anti-GITR mAb (DTA-1) used in those studies was generated in a rat and, consequently, did not bind to rat cells (9). We performed experiments using cocultures of rat CD4+CD25− responders, mouse CD4+CD25+ suppressors, and irradiated rat APCs. Cocultured mouse CD4+CD25− responders, mouse CD4+CD25+ suppressors, and irradiated rat APCs were included as a control (Fig. 6⇑Ba). Similar to the data obtained from GITR−/− mice, no abrogation of CD4+CD25+-mediated suppression occurred, unless GITR could be cross-linked on the responding CD25− population (Fig. 6⇑Bb). A further analysis of the rat/mouse system was accomplished by examining the dilution of CFSE by cocultured rat CD4+CD25− and mouse CD4+CD25+ T cells by flow cytometry. In the presence of the isotype control Ab, the rat CD4+CD25− T cells were only partially suppressed by mouse CD4+CD25+ T cells when cultured at a 1:8 suppressor to responder ratio (Fig. 6⇑C, left histograms). However, the addition of the anti-GITR Ab led to an additional expansion of the mouse CD4+CD25+ T cells, and a consequent increase in the suppression of the rat T cells (Fig. 6⇑C, right histograms). The increased CFSE dilution of mouse CD4+CD25+ T cells following GITR ligation could be partially inhibited by the addition of blocking anti-CD25 Abs, suggesting that IL-2 initially made by the responder T cells was also required for this expansion (data not shown). Together, these results unequivocally demonstrate that engagement of GITR on responder CD4+CD25− T cells is required to overcome CD4+CD25+ T cell-mediated suppression. Because both CD28 and GITR appeared to provide costimulatory signals during the activation of T cells, we sought to determine whether they played distinct roles during the primary response. We compared the capacity of GITR and CD28 to promote T cell proliferation in the presence or absence of endogenous LN CD4+CD25+ T cells and with or without the addition of exogenous IL-2. The same samples used for proliferation studies were simultaneously assessed for CFSE dilution following the 72-h culture period. Some degree of proliferation was measurable among intact LN cells from wild-type mice (Fig. 7⇓Aa). This response was significantly enhanced following depletion of CD25+ T cells, indicating that CD25+ T cells resident in the normal LN were mediating suppression under these culture conditions (Fig. 7⇓, compare a and b). However, measurement of [3H]thymidine incorporation by intact LN cells from both GITR−/− and CD28−/− animals indicated that their proliferative responses were totally suppressed (Fig. 7⇓Aa). Consistent with their reduced expression of GITR (data not shown), the responses of LN cells from GITR+/− animals were intermediate between those of wild-type and GITR−/− animals. In contrast, in the absence of CD4+CD25+ T cells, the responses of CD4+ and CD8+ LN T cells from GITR−/− mice were comparable to those of wild-type mice, as assessed by [3H]thymidine incorporation (Fig. 7⇓Ab) and CSFE dilution (Fig. 7⇓B, top panels), although CD4+ and CD8+ T cells from CD28−/− animals were still not proliferating after 72 h, even in the absence of CD4+CD25+ T cells (Fig. 7⇓Ab). GITR signals are required to overcome suppression mediated by endogenous regulatory T cells. A, LN cells (5 × 104) from B6 (▴), GITR+/− (×), CD28−/− (▪), and GITR−/− (♦) mice were cultured for 72 h with different concentrations of soluble anti-CD3 mAb (concentration on x-axis). Intact LN cells were cultured without (Aa) or with (Ac) exogenous IL-2 (50 U/ml). CD25+-depleted LN cells were cultured without (Ab) or with (Ad) exogenous IL-2 (50 U/ml). B, Flow cytometric assessment of CFSE dilution by CD4+- and CD8+-gated LN T cells after 72-h culture. The results correspond to the 0.63 μg/ml concentration of soluble anti-CD3 shown in A. Bars indicating the SD values were omitted for clarity. C, Flow cytometric analysis of CD25 expression by activated or unstimulated (dashed histogram) CD4+CD25− T cells from GITR−/− (open histogram) or GITR+/+ (filled histogram) mice (gated on H-2Db) after 24-h culture in the absence (top panels) or presence (bottom panels) of 50 U/ml human rIL-2, anti-CD3 (0.5 μg/ml), and LN APCs from wild-type mice. CD4+CD25− T cells were cocultured in the absence (left panels) or presence (right panels) of CD4+CD25+ T cells from BALB/c mice at a 1:2 suppressor to responder ratio. Results above are representative of three independent experiments. A very different pattern of responsiveness was observed when exogenous IL-2 was added to the cultures of intact LN cells. CD4+ and CD8+ T cell proliferation was completely inhibited in the absence of GITR, as assayed by [3H]thymidine uptake (Fig. 7⇑Ac) or by the lack of CFSE dilution (Fig. 7⇑B, middle panels). In contrast, measurable proliferation of T cells from CD28−/− animals was detected by [3H]thymidine incorporation (Fig. 7⇑Ac), although the CFSE profile demonstrated that CD8+ T cells were largely responsible for the proliferation measured (Fig. 7⇑B). 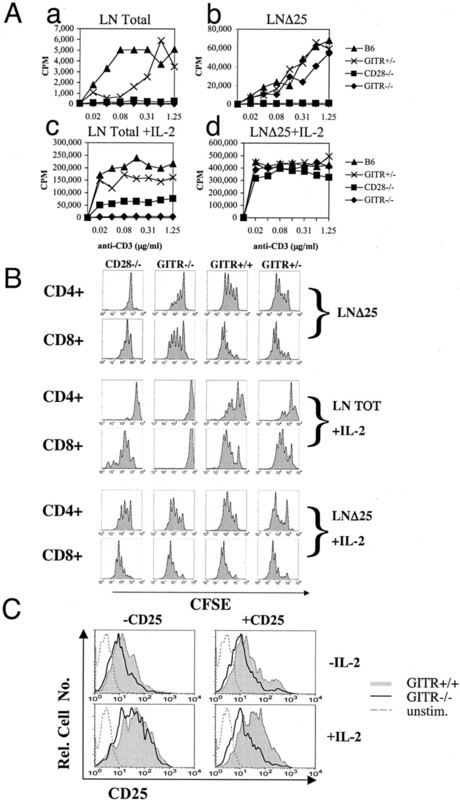 In the presence of IL-2, LN cells depleted of CD4+CD25+ T cells from all animals displayed similar levels of proliferation, as assessed by [3H]thymidine incorporation (Fig. 7⇑Ad) and CFSE dilution (Fig. 7⇑B, bottom panels). Taken together, these results indicate that the defects in T cell activation in GITR−/− and CD28−/− mice are distinct. The inability of total T cells present in LNs of GITR−/− mice to proliferate in the presence of exogenous IL-2 suggested that the expression of the high affinity IL-2R might be affected in these animals. Because the expression of the IL-2R α-chain is primarily induced by its ligand (26, 27), we examined the ability of anti-CD3-activated CD4+CD25− T cells from GITR−/− mice to express this chain in the presence or absence of CD4+CD25+ T cells and in the presence or absence of IL-2. In the presence of regulatory T cells, the addition of IL-2 to cocultures resulted in enhanced expression of CD25 by GITR+/+, but not GITR−/− CD4+CD25− T cells after 24 h of culture (Fig. 7⇑C, bottom right histogram). However, the ability of GITR−/−CD4+CD25− T cells to undergo IL-2-induced CD25 expression could be readily restored by removing CD4+CD25+ T cells (Fig. 7⇑C, bottom left histogram). Thus, the impairment in IL-2 responsiveness by GITR−/− T cells in the presence of CD4+CD25+ T cells was due, at least in part, to their inability to express the high affinity IL-2R in the presence of concentrations of exogenous IL-2 sufficient to induce CD25 expression on wild-type cells. The data presented above revealed that at least a portion of the signals induced on CD25− T cells following ligation of GITR was distinct from those induced following CD28 ligation. However, the incomplete rescue of T cell proliferative responses in CD28−/− mice cultured with IL-2 in the presence of CD4+CD25+ T cells also suggested that the CD28/B7 pathway might share functions with GITR in reversing CD25+-mediated suppression. Alternatively, these results may rather indicate that GITR is a downstream target of CD28-mediated signaling. If so, this would raise the possibility that the apparent contrasuppression effects of CD28 are a consequence of its ability to induce functional GITR expression. In support of this latter possibility, previous studies have demonstrated that CD28-CD80/CD86 interactions enhance the expression and function of some TNFR family members (28, 29). To examine whether GITR is functionally downstream of CD28 signaling, purified CD4+CD25− and CD8+ T cells from CD28−/− or wild-type mice were activated with low concentrations of plate-bound anti-CD3 Ab in the presence or absence of plate-bound anti-CD28 Ab (Fig. 8⇓A). Although wild-type T cells exposed to anti-CD3 alone only slightly up-regulated GITR (Fig. 8⇓A, middle panels), the expression of GITR by both CD4+CD25− and CD8+ T cells was greatly enhanced by the inclusion of anti-CD28 (Fig. 8⇓A, bottom panels). Similarly, the up-regulation of GITR expression on CD4+CD25− T cells was markedly inhibited by the addition of anti-CD80/CD86 (Fig. 8⇓B, left histogram). The inhibition of GITR expression in cultures containing anti-CD80/CD86 was not secondary to reduced production of IL-2, as GITR up-regulation by CD4+CD25− T cells was not prevented in cultures containing anti-IL-2/IL-2R mAbs (Fig. 8⇓B, right histogram). The enhanced expression of GITR induced by CD28-derived costimulatory signals was paralleled by an enhanced responsiveness to GITR signaling (Fig. 8⇓C). The addition of the anti-GITR Ab (DTA-1) substantially enhanced the proliferation of both CD4+ and CD8+ T cells from wild-type mice (Fig. 8⇓C, left panels). However, when anti-CD80/CD86 was added to these cultures, the presence of the anti-GITR Ab only marginally increased the proliferation of GITR+/+ CD4+CD25− (Fig. 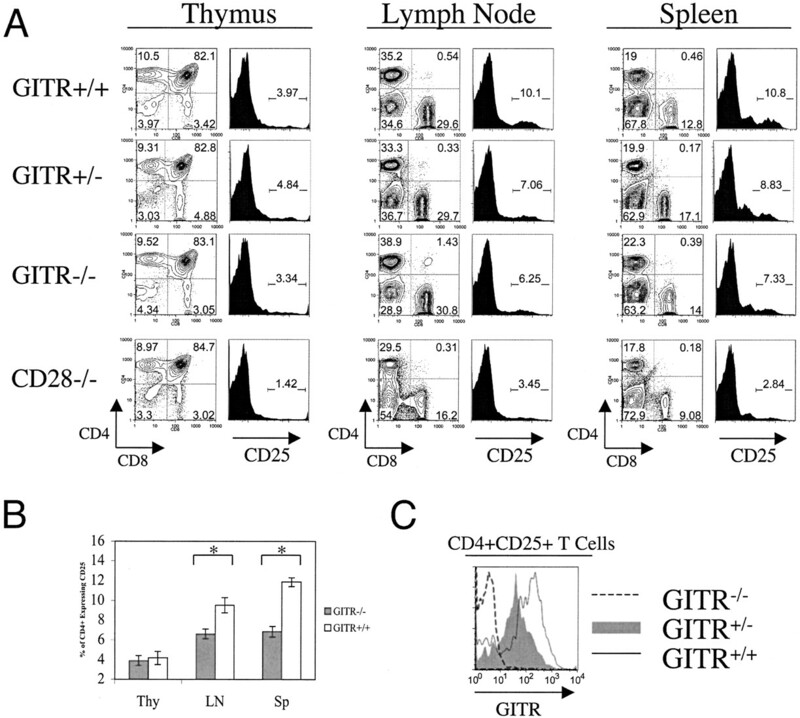 8⇓C, GITR+/+, top left; GITR−/−, top right) and GITR+/+ CD8+ T cells (Fig. 8⇓C, GITR+/+, bottom left; GITR−/−, bottom right) over the range of anti-CD3 concentrations tested. Treatment with anti-GITR did not affect the responses of purified CD4+CD25− and CD8+ T cells from GITR−/− mice (Fig. 8⇓C, right-hand panels). These data suggest that CD28-mediated signals, distinct from costimulation of IL-2 production, enhance GITR expression and facilitate GITR-mediated signaling. CD28-mediated signals enhance GITR responsiveness. A, Flow cytometric analysis of anti-GITR (DTA-1) staining of purified CD4+CD25− or CD8+ T cells (2.5 × 104) after 72-h culture with plate-bound anti-CD3 and 2 μg/ml of either plate-bound hamster isotype or plate-bound anti-CD28. B, Left histogram, Anti-GITR staining of CD4+CD25− T cells cultured in the presence of irradiated T cell-depleted splenocytes and soluble anti-CD3 (0.5 μg/ml) with or without a mixture of anti-CD80/86 (10 μg/ml of each) Abs for 72 h. B, Right histogram, Anti-GITR staining of CD4+CD25− T cells cultured in the presence of irradiated T-depleted splenocytes and soluble anti-CD3 (0.5 μg/ml) with or without a mixture of Abs against IL-2 and IL-2Rα. C, Proliferation was assessed in the presence or absence of anti-CD80/86 mAbs (10 μg/ml of each) with the addition of either anti-GITR mAb (2 μg/ml) or an isotype control Ab (2 μg/ml). Bars indicate the SD values. Results are representative of two to three independent experiments. The role of GITR in the function of CD4+CD25+ T cells was inferred from the demonstration that both poly- and monoclonal Abs to GITR reversed the suppressive effects of CD4+CD25+ T cells when added to cocultures of CD25+ and CD25− T cells (9, 10). The CD4+CD25+ T cells appeared to be the likely target for the anti-GITR reagents, as freshly explanted CD25+ T cells expressed GITR at higher levels than resting CD25− T cells and because anti-GITR together with IL-2 triggered the proliferation of CD25+, but not CD25− T cells, in the absence of a TCR signal. Furthermore, when Shimizu et al. (9) added a rat anti-mGITR mAb, which was nonreactive with rat cells, to cocultures of mouse CD25+ suppressors and rat responder T cells, a reversal of suppression was observed. These studies led to the hypothesis that engagement of GITR by agonistic anti-GITR Abs and, presumably by its physiological ligand, generated a signal that both inhibited the suppressor activity of CD4+CD25+ T cells and reversed the nonresponsiveness of the CD25+ T cells to exogenous IL-2. In this study, we have extended these studies by cloning the mouse GITR-L, analyzing its tissue distribution, and definitively determining the target for the agonistic anti-GITR Abs by using mixtures of CD25+ and CD25− T cells from wild-type and GITR−/− mice. Collectively, our studies demonstrate that the anti-GITR Abs and GITR-L abrogate the suppressive effects of CD4+CD25+ T cells by providing CD25− T cells a unique signal that raises their threshold for suppression by CD4+CD25+ T cells. Our studies indicate that GITR-L is selectively expressed on the cell surface of APC with the highest level of expression seen on B-1 B lymphocytes; intermediate levels on conventional B-2 B lymphocytes, macrophages, and B220+ DCs; and lower levels on B220− DC subsets. GITR-L is unique among members of the TNF superfamily in that it is expressed on resting APC, and its expression is down-regulated by triggering the BCR, CD40, or different TLRs. Other members of the TNF superfamily (4-1BB-L, OX40-L, lymphotoxin-like inducible protein that competes with glycoprotein D for binding herpesvirus entry mediator on T cells, CD70, CD30-L) are not detectable on resting APC, and their expression is up-regulated by activation of the APC via TLR stimulation (30). We have not yet addressed whether the down-regulation of GITR-L expression from the cell surface is accompanied by secretion of soluble GITR-L, but Tone et al. (13) have reported that LPS stimulation of DC, macrophages, and B cells results in down-regulation of GITR-L mRNA. The expression of GITR-L on resting APC strongly suggests that it functions early in the process of T cell activation. Other cell types, including endothelial cells (31, 32) and certain subsets of DN thymocytes, were also shown to express GITR-L, and the function of this molecule on these cell types remains to be determined. In contrast to the results of Tone et al. (13), we find that activated T cells also express the GITR-L. Although the precise reason for this discrepancy is not clear, it is possible that differences in the culture conditions or the source of T cells may partially account for the inability of Tone et al. to detect GITR-L expression. The expression of the GITR-L by T cells raises the possibility that T-T interactions may result in mutual resistance to CD25+-mediated suppression, even if activated APCs down-regulate GITR-L. However, further studies are needed in vivo to further clarify the role of GITR-L expressed by T cells in preventing suppression by CD4+CD25+ T cells. The ability of both the anti-GITR Abs and the GITR-L-expressing cells to enhance the activation of CD25− T cells alone, as well as the ability of anti-GITR-L to partially inhibit the activation of CD25− T cells in the absence of CD25+ T cells, prompted us to carefully re-examine the cellular target(s) of these reagents. The addition of anti-GITR to cocultures of CD25+ and CD25− T cells from wild-type and GITR−/− mice demonstrated that the target for the Ab-mediated reversal of suppression was the CD25− T cell. This was further supported by experiments using rat CD25− responder and mouse CD25+ suppressor T cells in cocultures, which conclusively demonstrated GITR ligation on the CD25+ T cell subset does not abrogate their suppressive function. In fact, an examination of CFSE dilution demonstrated that GITR ligation promoted the expansion of CD25+ T cells in cocultures, which ultimately enhanced the suppression of the rat CD25− responders. Therefore, it is possible that the enhanced proliferation of anti-GITR-treated cocultures reported by Shimizu et al. (9) and Ronchetti et al. (16), which was presumed to be due to CD25− T cells, actually reflected proliferation of the mouse CD25+ suppressor cells. This would not have been apparent in either of these studies, which only measured [3H]thymidine incorporation. One previous report suggested that unseparated GITR-deficient LN cells are hyperreactive to TCR stimulation (16), while in this work, in seemingly analogous experiments, we report nearly opposite results (Fig. 6⇑A). However, it should be noted that the means of delivering the TCR stimulus was different in the present study, which used soluble anti-CD3, as compared with the high concentrations of plate-bound anti-CD3 (10 μg/ml) used by Ronchetti et al. (16). This difference is noteworthy, as it has been previously shown that CD4+CD25+ T cells are unable to suppress the proliferative responses of CD25− T cells to plate-bound anti-CD3 (20). Thus, the enhanced susceptibility of GITR−/− CD25− T cells to suppression would not likely be apparent under the culture conditions used by Ronchetti et al. (16). In a more recent study by this same group (33), no significant differences in the ability of purified GITR−/− CD25− T cell subsets to proliferate in response to anti-CD3 were detected, consistent with our own data. The T cell hyperresponsiveness in GITR−/− mice originally reported (27) is also inconsistent with the observation made by several groups, using either cells expressing GITR-L, soluble GITR-L, or agonistic anti-GITR Abs, that GITR ligation enhances rather than diminishes the responsiveness of T cells. Under the limiting conditions used in this study, in the presence of physiological numbers of regulatory T cells, both CD4+ and CD8+ T cells from GITR−/− animals were completely unresponsive to CD3 cross-linking. This result clearly demonstrates that in the absence of GITR/GITR-L interactions suppression is dominant. Indeed, the suppression of activation of CD4+CD25− T cells from GITR−/− mice was so strong that it could not be overcome by the addition of a high concentration of exogenous IL-2, which normally promotes CD4+CD25− T cell proliferation even in the presence of much higher numbers of CD25+ T cells (20, 34). The suppressive effects of the CD4+CD25+ were mediated by inhibition of expression of CD25 by the CD4+CD25− GITR−/− responder population, which resembles what has been previously described for the effects of CD4+CD25+ T cells on normal CD8+ T cell responses (35). The costimulatory signals delivered by GITR and CD28 appeared to be distinct, but interrelated. In the absence of regulatory T cells, the responses of both CD4+ and CD8+ T cells from GITR−/− mice were comparable to those of wild-type mice. In contrast, under the culture conditions used in this study, CD4+ and CD8+ T cells from CD28−/− mice were nonresponsive. Conversely, when IL-2 was added to cultures containing regulatory T cells, the responses of CD4+ and CD8+ T cells from the GITR−/− mice were not restored, while the responses of CD8+ cells from the CD28−/− mice were partially restored. In contrast, a potential cooperative relationship and shared signaling hierarchy between CD28 and GITR were supported by the demonstration that CD4+CD25− and CD8 T cells failed to up-regulate GITR in the absence of CD28 cross-linking, and that anti-CD80/CD86 Abs markedly inhibited both the up-regulation of GITR expression and responsiveness to anti-GITR Abs. Thus, our results suggest that an additional important function of the CD28-CD80/CD86 signaling pathway during T cell activation is to license T cell resistance to CD25+-mediated suppression by enhancing the expression and function of GITR. Similar to the results suggested by other published studies (9, 13), we found that ligation of GITR on CD25− T cells, in the absence of regulatory T cells, did provide some degree of costimulation, as we could partially inhibit the responses of CD25− T cells with anti-GITR-L. However, GITR ligation is not required for costimulating CD25− T cells in the same manner as CD28, as the responses of CD4+CD25− and CD8 T cells from GITR−/− are comparable to wild-type T cells. We favor the view that engagement of GITR on both CD4+CD25− and CD8+ effector T cells by GITR-L early during the course of an immune response serves primarily to render the effector population resistant to the suppressive effects of the CD4+CD25+ T cells. During the course of the response, inflammatory signals ultimately result in the down-regulation of GITR-L expression, which may increase the susceptibility of the effector cells to CD25+-mediated suppression. In apparent contradiction to this idea, one study has suggested that the production of soluble factors by activated DCs is required to overcome CD25+-mediated suppression (36). The authors of that study postulate that CD4+CD25+ T cells may suppress the initiation of the adaptive immune response. The previous work suggesting that the addition of exogenous IL-2 could abrogate the suppressive effects of CD4+CD25+ was based on the use of T cell proliferation as a measure of suppression (34). However, more recent studies have demonstrated that while IL-2 does promote proliferation of CD4+CD25− T cells in the presence of CD4+CD25+ T cells, transcription of IL-2 message by CD4+CD25− T cells remains fully suppressed. Furthermore, this same study demonstrated that the absence of IL-2 in vitro diminished the suppressive function of CD4+CD25+ T cells (37). Thus, the possibility that suppression occurs subsequent to, rather than during, the initiation of the adaptive response is suggested by the observations, both in vitro and in vivo, that IL-2 produced by activated CD25− T cells is required for CD4+CD25+ T cell suppressor function (37, 38). In addition, other in vivo studies have also suggested that CD25+-mediated suppression operates at the contraction, rather than initiation, of the response to prevent tissue damage secondary to exuberant inflammation (39). Our data concerning the expression of the GITR-L support these possibilities. A number of recent reports using anti-GITR Abs (14, 33, 40), GITR-L-transfected cells (13, 33), or a soluble form of the GITR-L in vitro (13, 14, 41) have demonstrated that engagement of the GITR results in costimulation of the function of CD4+CD25− T cells in the absence of CD4+CD25+ regulatory T cells. Most notably, Kohm et al. (40) were also able to demonstrate that treatment of mice with anti-GITR following depletion of CD4+CD25+ T cells resulted in significant enhancement of experimental autoimmune encephalomyelitis. Taken together with our studies demonstrating a failure to reverse suppression in cocultures of CD4+CD25+ T cells from GITR+/+ mice and CD4+CD25− T cells from GITR−/− mice, it appears that engagement of the GITR on CD4+CD25+ plays no role in abrogating suppression mediated by CD4+CD25+ T cells in vitro. However, it should not be inferred from our studies that GITR ligation on CD4+CD25+ T cells fails to produce biological effects on this subset. In fact, it has been previously shown that engagement of GITR on purified CD25+ T cells cultured in the presence of exogenous IL-2 induces their expansion (10). Thus, it remains possible that in vivo, engagement of GITR on CD25+ T cells by GITR-L on resting APC results in the nonspecific expansion of regulatory T cells in the presence of IL-2 secreted by effector T cells early in the course of the immune response, which is supported by our in vitro studies (Fig. 6⇑D). This nonspecific expansion may be critical to the subsequent generation of a pool of Ag-specific suppressor cells that function to inhibit effector cell activity later in the response. Furthermore, the reduced frequency of CD4+CD25+ T cells present in GITR−/− mice may indicate that GITR plays an important role in their regulatory T cell homeostasis, although further work is clearly needed to more carefully evaluate this possibility. Finally, we have previously proposed that manipulation of GITR/GITR-L interactions may prove to be an effective way of manipulating regulatory T cell function in vivo (42). Although this concept was based on data suggesting that the CD4+CD25+ T cell was the target of the anti-GITR, we still believe that the GITR/GITR-L interaction represents an important therapeutic target. Thus, treatment with an agonist anti-GITR or an agonistic GITR-L-Fc should render effector cells resistant to the suppressive effects of CD4+CD25+ T cells and may prove to be a valuable adjuvant for enhancement of the immune response to tumor vaccines or weak vaccines for infectious agents. Similarly, inhibition of GITR/GITR-L interactions with a blocking anti-GITR-L or GITR-Fc may lower the threshold of effector T cells to suppression and thus be a valuable therapeutic adjunct for the treatment of autoimmune diseases, graft-vs-host disease, and prevention of graft rejection. We thank Pat Korty for screening GITR−/− mice, Carlo Riccardi for providing GITR−/− mice, and Shimon Sakaguchi for providing the anti-GITR Ab (clone DTA-1). ↵1 Current address: Malaghan Institute of Medical Research, Wellington School of Medicine, Wellington, New Zealand. ↵3 Abbreviations used in this paper: GITR, glucocorticoid-induced TNFR family-related receptor; DC, dendritic cell; DN, double negative; GITR-L, GITR ligand; LN, lymph node; mGITR, murine GITR. Aseffa, A., A. Gumy, P. Launois, H. R. MacDonald, J. A. Louis, F. Tacchini-Cottier. 2002. The early IL-4 response to Leishmania major and the resulting Th2 cell maturation steering progressive disease in BALB/c mice are subject to the control of regulatory CD4+CD25+ T cells. J. Immunol. 169:3232. Kursar, M., K. Bonhagen, J. Fensterle, A. Kohler, R. Hurwitz, T. Kamradt, S. H. Kaufmann, H. W. Mittrucker. 2002. Regulatory CD4+CD25+ T cells restrict memory CD8+ T cell responses. J. Exp. Med. 196:1585. Belkaid, Y., C. A. Piccirillo, S. Mendez, E. M. Shevach, D. L. Sacks. 2002. CD4+CD25+ regulatory T cells control Leishmania major persistence and immunity. Nature 420:502. Lundgren, A., E. Suri-Payer, K. Enarsson, A. M. Svennerholm, B. S. Lundin. 2003. Helicobacter pylori-specific CD4+ CD25high regulatory T cells suppress memory T-cell responses to H. pylori in infected individuals. Infect. Immun. 71:1755. Maloy, K. J., L. Salaun, R. Cahill, G. Dougan, N. J. Saunders, F. Powrie. 2003. CD4+CD25+ T(R) cells suppress innate immune pathology through cytokine-dependent mechanisms. J. Exp. Med. 197:111. Hisaeda, H., Y. Maekawa, D. Iwakawa, H. Okada, K. Himeno, K. Kishihara, S. Tsukumo, K. Yasutomo. 2004. Escape of malaria parasites from host immunity requires CD4+CD25+ regulatory T cells. Nat. Med. 10:29. Uraushihara, K., T. Kanai, K. Ko, T. Totsuka, S. Makita, R. Iiyama, T. Nakamura, M. Watanabe. 2003. Regulation of murine inflammatory bowel disease by CD25+ and CD25− CD4+ glucocorticoid-induced TNF receptor family-related gene+ regulatory T cells. J. Immunol. 171:708. Yu, K. Y., H. S. Kim, S. Y. Song, S. S. Min, J. J. Jeong, B. S. Youn. 2003. Identification of a ligand for glucocorticoid-induced tumor necrosis factor receptor constitutively expressed in dendritic cells. Biochem. Biophys. Res. Commun. 310:433. Tone, M., Y. Tone, E. Adams, S. F. Yates, M. R. Frewin, S. P. Cobbold, H. Waldmann. 2003. Mouse glucocorticoid-induced tumor necrosis factor receptor ligand is costimulatory for T cells. Proc. Natl. Acad. Sci. USA 100:15059. Kim, J. D., B. K. Choi, J. S. Bae, U. H. Lee, I. S. Han, H. W. Lee, B. S. Youn, D. S. Vinay, B. S. Kwon. 2003. Cloning and characterization of GITR ligand. Genes Immun. 4:564. Blair, P. J., J. L. Riley, B. L. Levine, K. P. Lee, N. Craighead, T. Francomano, S. J. Perfetto, G. S. Gray, B. M. Carreno, C. H. June. 1998. CTLA-4 ligation delivers a unique signal to resting human CD4 T cells that inhibits interleukin-2 secretion but allows Bcl-xL induction. J. Immunol. 160:12. Ronchetti, S., G. Nocentini, C. Riccardi, P. P. Pandolfi. 2002. Role of GITR in activation response of T lymphocytes. Blood 100:350. Ouyang, W., S. H. Ranganath, K. Weindel, D. Bhattacharya, T. L. Murphy, W. C. Sha, K. M. Murphy. 1998. Inhibition of Th1 development mediated by GATA-3 through an IL-4-independent mechanism. Immunity 9:745. Coligan, J. E., A. M. Kruisbeek, D. H. Margulies, E. M. Shevach, W. Strober. 2003. Current protocols in immunology. R. Coico, ed. In Current Protocols Vol. 1:2.5.4. Wiley, New York. Vremec, D., J. Pooley, H. Hochrein, L. Wu, K. Shortman. 2000. CD4 and CD8 expression by dendritic cell subtypes in mouse thymus and spleen. J. Immunol. 164:2978. Godfrey, D. I., J. Kennedy, T. Suda, A. Zlotnik. 1993. A developmental pathway involving four phenotypically and functionally distinct subsets of CD3−CD4−CD8− triple-negative adult mouse thymocytes defined by CD44 and CD25 expression. J. Immunol. 150:4244. Tang, Q., K. J. Henriksen, E. K. Boden, A. J. Tooley, J. Ye, S. K. Subudhi, X. X. Zheng, T. B. Strom, J. A. Bluestone. 2003. Cutting edge: CD28 controls peripheral homeostasis of CD4+CD25+ regulatory T cells. J. Immunol. 171:3348. Malek, T. R., J. D. Ashwell. 1985. Interleukin 2 up-regulates expression of its receptor on a T cell clone. J. Exp. Med. 161:1575. Depper, J. M., W. J. Leonard, C. Drogula, M. Kronke, T. A. Waldmann, W. C. Greene. 1985. Interleukin 2 (IL-2) augments transcription of the IL-2 receptor gene. Proc. Natl. Acad. Sci. USA 82:4230. Gilfillan, M. C., P. J. Noel, E. R. Podack, S. L. Reiner, C. B. Thompson. 1998. Expression of the costimulatory receptor CD30 is regulated by both CD28 and cytokines. J. Immunol. 160:2180. Rogers, P. R., J. Song, I. Gramaglia, N. Killeen, M. Croft. 2001. OX40 promotes Bcl-xL and Bcl-2 expression and is essential for long-term survival of CD4 T cells. Immunity 15:445. Croft, M.. 2003. Co-stimulatory members of the TNFR family: keys to effective T-cell immunity?. Nat. Rev. Immunol. 3:609. Gurney, A. L., S. A. Marsters, R. M. Huang, R. M. Pitti, D. T. Mark, D. T. Baldwin, A. M. Gray, A. D. Dowd, A. D. Brush, A. D. Heldens, et al 1999. Identification of a new member of the tumor necrosis factor family and its receptor, a human ortholog of mouse GITR. Curr. Biol. 9:215. Kwon, B., K. Y. Yu, J. Ni, G. L. Yu, I. K. Jang, Y. J. Kim, L. Xing, D. Liu, S. X. Wang, B. S. Kwon. 1999. Identification of a novel activation-inducible protein of the tumor necrosis factor receptor superfamily and its ligand. J. Biol. Chem. 274:6056. Ronchetti, S., O. Zollo, S. Bruscoli, M. Agostini, R. Bianchini, G. Nocentini, E. Ayroldi, C. Riccardi. 2004. Frontline: GITR, a member of the TNF receptor superfamily, is costimulatory to mouse T lymphocyte subpopulations. Eur. J. Immunol. 34:613. Piccirillo, C. A., E. M. Shevach. 2001. Cutting edge: control of CD8+ T cell activation by CD4+CD25+ immunoregulatory cells. J. Immunol. 167:1137. Thornton, A. M., E. E. Donovan, C. A. Piccirillo, E. M. Shevach. 2004. Cutting edge: IL-2 is critically required for the in vitro activation of CD4+CD25+ T cell suppressor function. J. Immunol. 172:6519. Suvas, S., U. Kumaraguru, C. D. Pack, S. Lee, B. T. Rouse. 2003. CD4+CD25+ T cells regulate virus-specific primary and memory CD8+ T cell responses. J. Exp. Med. 198:889. Kohm, A. P., J. S. Williams, S. D. Miller. 2004. Cutting edge: ligation of the glucocorticoid-induced TNF receptor enhances autoreactive CD4+ T cell activation and experimental autoimmune encephalomyelitis. J. Immunol. 172:4686. Ji, H. B., G. Liao, W. A. Faubion, A. C. Abadia-Molina, C. Cozzo, F. S. Laroux, A. Caton, C. Terhorst. 2004. Cutting edge: the natural ligand for glucocorticoid-induced TNF receptor-related protein abrogates regulatory T cell suppression. J. Immunol. 172:5823.